SAN ANTONIO (AP) The New Orleans Pelicans took advantage of yet another Spurs injury to tighten the Western Conference playoff race even further. Anthony Davis had 26 points and 15 rebounds, and New Orleans rallied in the final two minutes to beat San Antonio 121-116 on Wednesday night, adding to the Spurs’ misery after losing LaMarcus Aldridge to an injury in the first half. 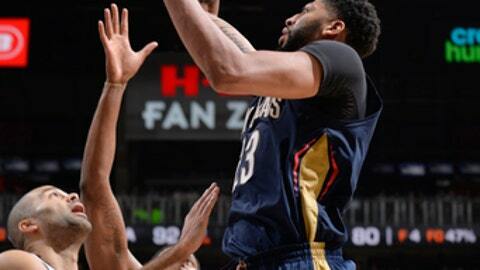 New Orleans overcame a 15-point deficit and won its seventh straight to move within a half-game of San Antonio, which dropped a game behind Minnesota for third in the West. San Antonio, which has been without superstar forward Kawhi Leonard for all but nine games this season, lost Aldridge to a sprained right ankle late when he landed awkwardly while defending a driving hook shot by Davis with three minutes left in the second quarter. The injury would prove critical down the stretch for the Spurs, who’ve lost five of six. The team did not immediately disclose how long Aldridge will be out. Jrue Holiday finished with 25 points and Rajon Rondo added 13 points and 12 assists for the Pelicans. Rudy Gay had 19 points for the Spurs and Dejounte Murray scored 18. The Spurs surged to a 60-51 lead at the half, and Holiday said Gentry’s halftime speech ”lit a fire” under the Pelicans. New Orleans responded by outscoring San Antonio 70-56 in the second half, including a 34-21 advantage in the fourth quarter. Davis’ alley-oop dunk gave New Orleans its first lead at 114-113 with just under 2 minutes left. After Murray and the Pelicans’ E’Twaun Moore exchanged 3-pointers, Holiday collected a turnover by Patty Mills. Holiday was fouled and missed the ensuing free throws, but Davis fought through the smaller Spurs and was fouled while collecting the miss. Davis made two free throws to give New Orleans a 119-116 lead. Mills and Gay both missed 3-pointers on the Spurs’ final possession. Pelicans: The Pelicans are 18-14 on the road this season, one of only five teams in the West with a winning record away from home. … New Orleans had lost five straight in San Antonio. The Pelicans’ last victory at the AT&T Center was Nov. 8, 2014. Spurs: Aldridge finished with eight points, snapping a 59-game streak of scoring in double figures. . After missing the first 27 games of the season, Leonard has missed 17 games since returning to the sidelines following a nine-game return. … Pau Gasol (bruised left knee bone) did not play. Davis Bertans started his eighth game of the season. … Tony Parker passed Tim Duncan for fourth in Spurs history in steals with 1,026. San Antonio coach Gregg Popovich was ejected with 11:13 remaining in the third quarter after arguing that Rajon Rondo should have been ruled out of bounds on a play in which he saved the ball. Popovich emerged from the locker room after the game to praise the Spurs’ efforts. Ginobili continues to astound competitors in his 16th season. The 40-year-old finished with 17 points in 20 minutes. Davis and the Pelicans are keeping a close eye on the standings with 3 1/2 games separating third through ninth place in the West. Pelicans: Visit Dallas on Sunday night. Spurs: Host the Los Angeles Lakers on Saturday night.